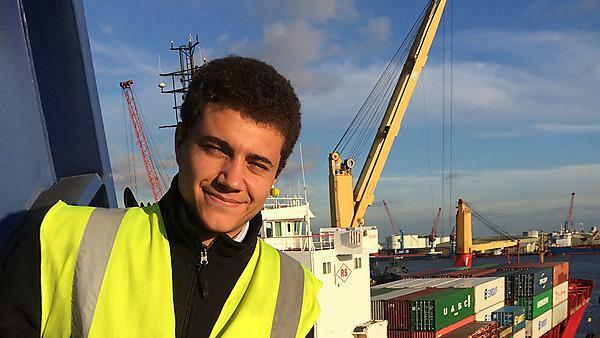 Since graduating in 2015, Bartolome Bauza has been employed by the Danish shipping company DFDS on a two year trainee programme. I have been employed since September, 2015, by the Danish shipping company DFDS on a two year trainee programme where I work across different departments and offices at DFDS – I had to ask my employer for a few days off in order to be able to attend graduation. So far I have been working at the port of Immingham which is DFDS’s main UK hub, and I have been given the opportunity to visit other locations such as Felixstowe, Rotterdam, and Copenhagen to attend several other events and exhibitions. Definitely. University opened my eyes to the opportunities ahead of me: the sky is the limit. I’ve only been in employment for nine months, but I would say that meeting deadlines when you haven’t been given an actual deadline per se is the hardest thing. Also, it’s very easy to be content with the current situation; so, sometimes, I find it more challenging to push myself. Not long ago I spent half a day inside a container crane alongside a crane driver whilst loading and discharging a container ship. This might not sound very exciting for somebody outside the shipping industry, but it was outstanding – especially listening to the individual experiences of the driver himself. During my time at university I should have pushed myself to learn Mandarin, as I was given this amazing opportunity. I will pick it back up again someday soon, though. Get involved in as many events and activities as you can, and always be curious and listen to advice. Plymouth was a very comfortable and student-friendly university that gave me every opportunity to develop. Although I still have many new skills and experiences to learn, Plymouth set the foundation for this development. It was always very useful to know that you had your lecturers to ask for advice or some kind of support. They were always very approachable and supportive. There are too many amazing memories: from nights out, to five-a-side football matches, to evening BBQs… even trips abroad with classmates. This one time we organised a day activity which involved the cleaning of a beach, and it was a good day out with both students and lecturers involved. I keep a very good relationship with a few lecturers and I like to catch up as often as I can. Regarding other alumni, I see them as friends and I meet up regularly with a few who live around the area I work. Hopefully, we will organise a catch up in the near future. There are a few friends who have begun their studies at Plymouth University after I recommended it, so I would most certainly encourage anyone that is looking to start a career – in shipping, particularly, but also generally – to take advantage of all the opportunities handed to you at Plymouth University.